Pau is a young entrepreneur who, at the age of 17, set up eyeOS, a company that was part of the start of Cloud Computing. In addition, he later created Bananity. Pau was recognised with the MIT Innovator of the Year award 2011 (TR-35) and the 2010 FPdGi Business Award. Want to learn more about this young award-winner’s business story? On 24 January, from 8 till 9 pm, you will be able to take part in the tweet interview with Pau Garcia-Milà asking him questions on Twitter at hashtag #PremisFPdGi. 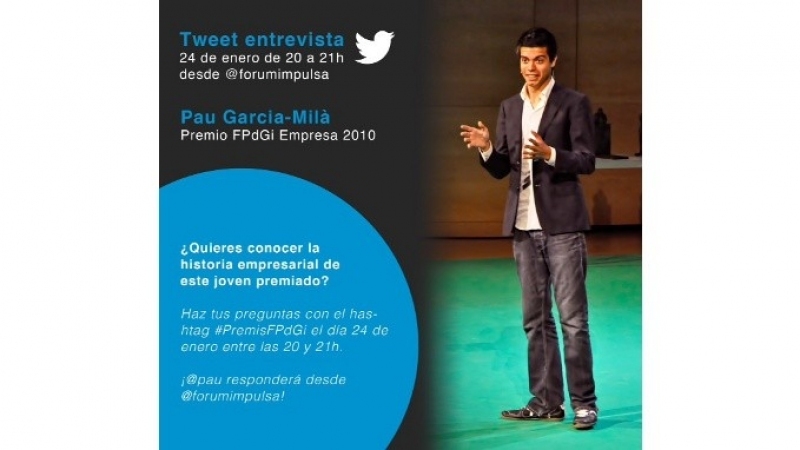 During the interview, Pau will respond to your questions on @forumimpulsa.